BATON ROUGE, La. (CNS) — Shortly after Labor Day, when the only signs of Christmas are at retail outlets and drug stores, Father Frank Uter takes a seat at his kitchen table of his rectory and pens personal tidings in Christmas cards to his parishioners. He sends cards to 4,100 families at Immaculate Conception Church in Denham Springs and its mission church, Sacred Heart in Livingston. He has carried out this tradition for decades, across the Diocese of Baton Rouge at the various church parishes where he has served. During that time, he has likely used many gallons of ink. Father Uter attended workshops on the encyclical, and in 1976 he was assigned his first pastorate, at St. Mary of False River Church in New Roads. After two years, Father Uter felt he needed to do more. He continued the tradition at each parish he was assigned to. When he came to Immaculate Conception, he faced the challenges of making contact with so many families. Father Uter has rules regarding his Christmas card project. Beginning in September he does not take a day off and in the evenings and on Sunday afternoons if he doesn’t have meetings, he will go to the (rectory) kitchen table and write cards so it doesn’t become like an office project. “Each year the secretaries give me a book with every family with the names and ages and nicknames, everything that can help me to make the card personal and ages of the children,” the priest said. If he sees a “zero” by a child’s name he writes a note to the parents that he hopes their first Christmas with their child is especially graced. He also keeps cards in alphabetical order, so that in case someone dies or becomes sick he can rewrite the card to their families; he often adds a thank-you for people’s ministry. This year’s card features a photo of pint-sized angels and shepherds from Immaculate Conception Early Learning Center’s 2017 Christmas pageant. Father Uter said the cards are put in the mail Dec. 17, the beginning of the “O” antiphons, the final preparation days for Christmas. 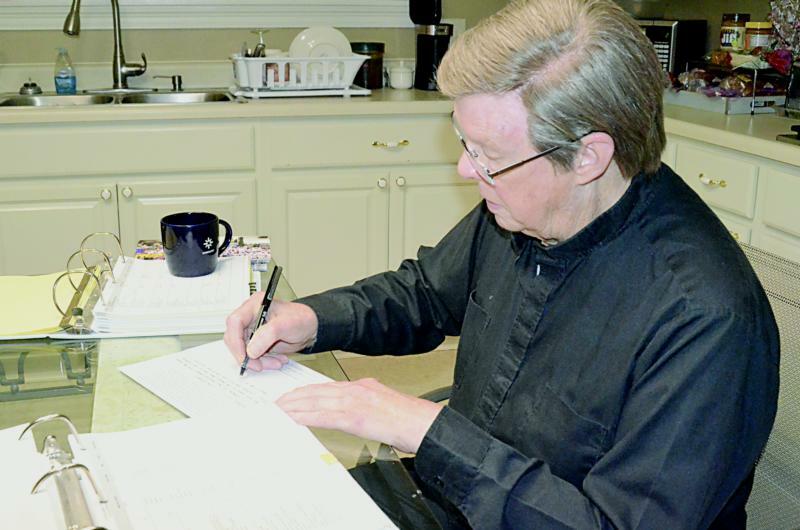 While it occasionally requires discipline to write in the cards, Father Uter said doing so helps him realize how blessed he is. “To be surrounded by so many good families — and just writing for a few hours I feel really good,” he said. Shelley is assistant editor of The Catholic Commentator, newspaper of the Diocese of Baton Rouge.